It's going to be a hot summer at Intertops Poker! Daily satellites with a chance to ultimately win a $12,500 WPT Paris prize package begin Monday. There’s also $10,000 up for grabs in the popular online poker room’s weekly FPP points race which continues through July. Each Intertops Grand Prix de Paris $12,500 prize package includes €7,500 for the Main Event seat, cash for travel expenses and official Intertops Poker merchandise. The WPT Grand Prix de Paris will take place at the world famous Aviation Club de France in the heart of Paris September 1st to 11th. Intertops will also give away another $10,000 ($2500 per week) in its ongoing FPP points race. Intertops Poker players earn Frequent Player Points whenever they are dealt cards at any real-money cash game or pay a tournament entry fee. Points are automatically converted into Gold Chips which can then be redeemed for prizes, free poker tournaments or as non-deposit bonuses. Those that finish in the top 50 Frequent Player Point earners each week in July will win a share of that week’s $2500 prize pool. Intertops Poker has recently changed its player rewards program to make it easier to use and understand. A recent software update gave the poker room, which had been online since 2003, a slick new look. Advanced tools including a poker hand analysis tool are now available to help every player improve their game. Intertops welcomes players from around the world to its online poker room, casino and sportsbook. After fifteen years of excellent service, players trust them to offer the best bonuses and promotions and to make their withdrawals quick and easy. 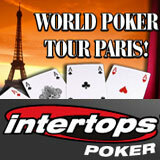 If you've played at Intertops Poker or the WPT Paris, please use the Comments box below to tell other players about it!